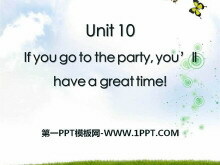 Unit1Where did you go on vacation? Unit2How often do you exercise? Unit4What's the best movie theater? 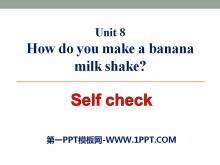 Unit8How do you make a banana milk shake? 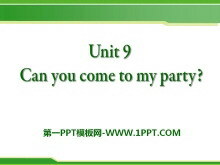 Unit9Can you come to my party? 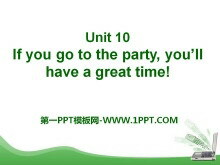 Unit10If you go to the party you'll have a great time! 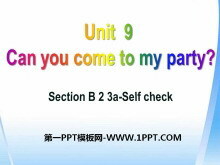 《If you go to the party you'll have a great time!》PPT课件22 Revision 一、将下列词组或句子翻译成英语。 1. 有许多担忧 have a lot of worries 2. 与某人交谈 talk to someone 3. 害怕做某事 be afraid to do sth. 4. 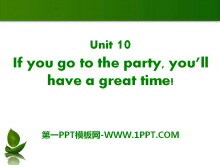 最..
《If you go to the party you'll have a great time!》PPT课件21 Warming up Some important things in our life. 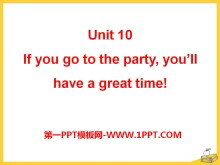 be happy go to college make a lot of money be famous travel around the world get an education Which of..
《If you go to the party you'll have a great time!》PPT课件20 if 引导一个条件状语从句 当主句是一般将来时时(will+动原)，if 引导的从句必须用现在时(动词用动原或三单形式)来表示将来可能发生的动作或存在的状态。 If it..
《If you go to the party you'll have a great time!》PPT课件19 Warming up She is going to walk to school. She will be late. If she _____ to school she _____ ___late. It is going to rain tomorrow. 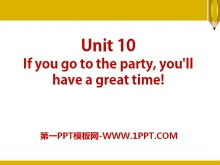 I will stay at ..
《If you go to the party you'll have a great time!》PPT课件18 能力提升训练 Ⅰ.单项选择 ( )1.If Mary is late again the teacher won't ________. 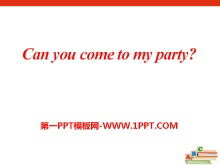 A．let in her B．let her in C．let she to D．let to her in ( )2.I do..
《Can you come to my party?》PPT课件20 1) bring to 把带来 2) take a trip去旅行 3) think of 认为 4) without doing sth. 没有做某事 5) so that 以便于；目的是 6) look forward to doing sth.期待做某事 7) be surprised..
《Can you come to my party?》PPT课件19 New words 1. invitation n. 邀请；请柬 preparation n. 准备；准备工作 动词+ ion (后缀)invitation 动词+ ion (后缀) preparation e.g. She didnt accept my invitation. 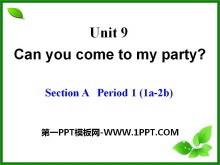 她没有接受..
《Can you come to my party?》PPT课件18 Revision 1. Write down these phrases. 1) 为做准备 ___________ 2) 得了流感 ___________ 3) 去见朋友 ______________ 4) 当然，我愿意去 ____________ 5) 太多作业 _______________..
《Can you come to my party?》PPT课件17 What do you have to do on weekdays? I have to go to school / do homework / get up early / clean the classroom / What do you have to do this weekends? 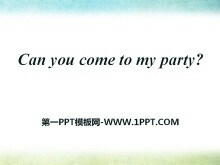 I have to I have to p..
《Can you come to my party?》PPT课件16 巩固词组(Ask and answer in pairs) A.Can you come to my party? B.SorryI cant. I have to_________. 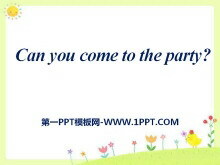 1.为考试而做准备 prepare for an exam 2.看医生 go to the doctor 3.上钢琴课 ..
《Can you come to my party?》PPT课件15 能力提升训练 Ⅰ.单项填空 ( )1.Would you like to go to the concert with me? I'd love to _______I'm afraid I have no time. A．so B．or C．and D．but ( )2.The old pen is brok..
《How do you make a banana milk shake?》PPT课件22 Have a review How many /How much How many apples/oranges/bananas do you need? I need three apples/oranges/bananas... How much yogurt/water do you need? I need o..